V.com weekend vote: What kind of shoulder rest works for you? October 6, 2017, 9:22 AM · Be wary of anyone who tells you the same thing works for everyone, when it comes to shoulder rests. Though there are some common principles when it comes to holding the violin and preventing injury, there are numerous solutions for the set-up that allows you do to so: the shoulder rest, chin rest, or the choice not to use one or both. Some people have broad shoulders, others more sloped. Some have long necks, or short, or in-between. Even the shape of your jaw and chin can make a difference, when it comes to holding the violin with ease and comfort. For some, the solution might be to have no shoulder rest at all. For those using a rest, there are many options, and it will likely take some experimentation to settle on the right one for you. Often the first option given to a student is some kind of foam cushion rest, as this tends to be the least expensive solution! A foam cushion rest can be cut from an old mattress pad, or one can buy something shaped especially for the violin such as the Acoustagrip, Komfort Kurve, Xeros and any number of other brands. More specialized are the clip-on rests such as a Kun, Wolf, Resonans or Viva. I've put "wooden" rests in another category, simply because they have such a different feel (and are considerably more expensive! ); some of those include the Mach One, Kun Bravo, and Viva la Musica. Some swear by the "Playonair," which seems to be the only brand of air cushion shoulder rests. Which do you use? Please mark it off in our vote, and then share more specifics in the comments. October 6, 2017 at 03:00 PM · Comford Cradle. I can't get your vote to work. October 6, 2017 at 03:02 PM · I've yet to find a shoulder rest that actually works for me, and playing restless is very uncomfortable, but clip-on shoulder rests are the most comfortable for me to use. Every shoulder rest I've tried either doesn't fit on my shoulder, doesn't raise the violin enough, or slips constantly. My main violin has odd measurements, and the lips of the front and back plates are smaller than normal, so all the clip-on rests I've tried either don't adjust to where they fit properly or don't make full contact with the violin (the feet that come with Kun rests can only touch my violin on one side of the lip of the back plate). October 6, 2017 at 03:16 PM · Wooden rests here. VLM Diamond suits me well on two fiddles, while Kun Bravo works better on the third. I have broad shoulders and a medium-short neck. I set my SRs lowest on shoulder side, about 1/2-inch higher on chest side. FWIW, I orient mine SW-NE as you view the back of the instruments. Jim, I align mine the same way. Sometimes I'm astonished, when I take a student's fiddle to tune it, how uncomfortable it feels to me, when the angle is different. But that's the angle that works perfectly for that student! October 6, 2017 at 04:04 PM · I started learning the violin earlier this year. And I was very lucky as I found a teacher who focuses on a good and relaxed posture (which is perfect for me since I always tend to be tense). So in the first lesson she advised me to skip the Kun which came with the loaned violin and get a Bonmusica which she then helped me to adjust to my body. And what a difference that is. I am able to play without any tension in shoulders or neck muscles. October 6, 2017 at 04:12 PM · I used a Kun for years on my violin and wasn't happy with it. I could never adjust it to my satisfaction and t would never stay in place and I had to use a large rubber band as a "safety belt". When I got my viola, my luthier sold me an Everest (pun intended by the manufacturer) and I've been very happy with it. It stays in place on its own and is more cushiony than my Kun. But it's larger than the Kun so I have to carry it separately. On a related note: My happiness with the Everest over the Kun is combined with the fact that on my viola it's lower than the Kun was on my violin. I'm one of those string players with a giraffe neck, and a rest that doesn't have to be raised so much is more secure. October 6, 2017 at 04:29 PM · Everybody knows that no one needs to use a shoulder rest to play the violin. The shoulder rest is helpful in the beginning learning process. Period. 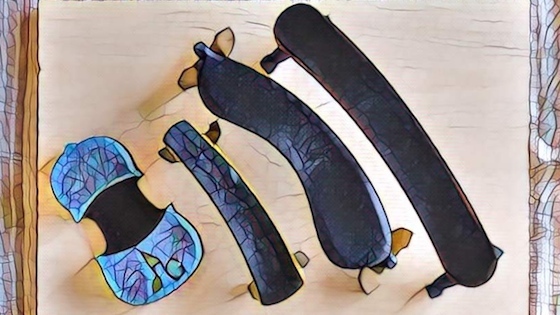 October 6, 2017 at 04:34 PM · Finding the right shoulder rest has been a nightmare for me. I have a large box full of tried and rejected models. I have very square, broad shoulders and have struggled to find anything low enough on the shoulder side. At the moment I'm using an Everest that I have modified by sawing down the shoulder side to make it low enough - it's not perfect but it's the best I've come up with so far. I look forward to the day when someone starts offering a personalised 3D printed SR so everyone can get what they want. October 6, 2017 at 05:11 PM · ALL the popular rests (clipon?) have a shoulder-side swoop in them and thus lock me up when I use them. I use a wolf b/c I coul make it flat. That way I get the space-filler I need while approximating the freedom of the 'invisible.' i use wolf on both vln and vla. October 6, 2017 at 05:24 PM · I got mine from Bonmusica because it is adjustable in so many ways. It took me and my teacher a year to get it just so that it was comfortable after an hour of playing as well as at the start. October 6, 2017 at 05:37 PM · After trying a number of rests, I ended up settling on the Wolf. It works for me because it's extremely adjustable and still fits in my case. October 6, 2017 at 06:04 PM · I was using a BonMusica until a new teacher (who used a Wolf himself) asked me to try to play without a rest. I did and it worked! In hindsight the BonMusica gives an extremely secure hold, but the tradeoff is that it's extremely restrictive. I sold mine on eBay when I realized that, and that I would never go back to it. It's pretty damned heavy too! October 6, 2017 at 06:30 PM · I use a Wolf viola shoulder rest for my violin. October 6, 2017 at 06:32 PM · I started a long time ago without using a shoulder rest and I was quite comfortable. Many years later a bicycle fall resulted in a broken and dislocated left clavicle and when I returned to the violin I found that I could not hold the instrument properly. I went to my LVS (Local Violin Shop) tried a number of rests and went with an adjustable Wolf that angle that the violin rests on my shoulder. As an added bonus (or maybe my imagination) the violin seems to have a bit more resonance because the bottom plate doesn't touch anything. October 6, 2017 at 06:44 PM · I'm using the Bonmusica. It is remarkably adjustable in I think every possible way. I'm not sure I have it adjusted ideally yet, but have experimented quite a bit. I've twisted, bent, raised, lowered, even added a little extra foam. For now it's ok, tomorrow who knows I might readjust it again. October 6, 2017 at 06:48 PM · I'm using a Bonmusica. It is adjustable in every possible way. I've raised, lowered, bent, twisted, and even added a little foam to the lower part of it. It took me a while to get it ideal. For now it's good, but who knows, tomorrow I might change it again. October 6, 2017 at 06:55 PM · 'Fraid I'm with Evan; but the bonmusica seems the closest to working on the violin, not so good on the viola. I've yet to try the Kreddle chin rest. October 6, 2017 at 07:50 PM · NON at all. October 6, 2017 at 08:28 PM · Evan are you sure it's not your chin rest? I just use the good ol' Kun. But I customized my Kaufmann CR -- carved away the part that was cutting into my jaw. October 6, 2017 at 09:47 PM · See the photo on http://www.violinist.com/discussion/thread.cfm?page=528 Oct 2. Obviously, I couldn't possibly comment! October 6, 2017 at 09:52 PM · I used to use Kun but it's not high enough for me. I tried Bonmusica but I found it too restrictive somehow. I've been using Wolf Forte Primo for a few years and it seems fine. My teacher and some of her professional colleagues have switched to the Comford Cradle in recent years and love it. I wouldn't mind to give it a try. October 6, 2017 at 11:54 PM · Laurie, I just meant using "invisible" as the name since it's more amusing. I voted for none as all the hungarian teachers insist. October 6, 2017 at 11:57 PM · Yixi, my teacher also recommended against Bonmusica saying it is too restrictive on the shoulder (I think because it is longer than usual and sort of hooks on the back of your shoulder). I think a more proper voting would take into account which ones people have tried. I'm assuming some people have only tried 1 or 2 and stuck to it. October 7, 2017 at 12:55 AM · I'm currently not using a shoulder rest, and it seems to be working out. I've gotten back into playing after years away, intended to find one I liked, but am comfortable without one. October 7, 2017 at 01:21 AM · I use Kun wood supported by brass "legs" and foam. October 7, 2017 at 02:26 AM · Don't see a place to vote. However, I stopped using any shoulder rest a few years ago and think doing without it helps me. First, it allows me to move the violin to accommodate my arms so I can get to the tip of the bow. Secondly it seems to afford a freedom to feel more "connected" to the violin when playing expressively. It definitely takes some work to get used it it. October 7, 2017 at 02:53 AM · I was using Kun for years but my shoulder sometimes in pain and I switchrd to Wolf and found it more comfortable. October 7, 2017 at 03:17 AM · I have pretty much all the rest out there, from korfker, kun, VLM, acoustagrip to things like suretone rest. With a proper fit chinrest, I ended up using makeup pads. Gives me more freedom of movement. But I found VLM the best alternative due to its ability to adjust to really low. But VLM is still a bit restrictive playing at high position on G (like 10th position). VLM doesn’t change the tone much if done right. I also like the suretone quite a lot, but the weight tend to be heavy and may slip vs the regular make up pad (I don’t use padding that comes in the package at all, as it restricts the movement and violin tilt). I hope they can make something with lighter material similar to korfker. Korfker sounds the best among all rest I use, and is extremely light. But it locks (kind of hooked) the shoulder side and is restrictive. It’s also too high for me. So I still use the make-up pad after all the money spent. October 7, 2017 at 08:45 AM · For 60 years I have used a Voight wooden shoulder rest sadly now not available, there is no adjustment you just had to find the one that was right for you. I doubt I would find one that works better for me. October 7, 2017 at 12:48 PM · I tried a Kun but it never was comfortable; better than without, though. The first time I tried a Wolf Forte Primo, I couldn't believe how comfortable it was, and I've used nothing else since. That was about ten years ago. October 7, 2017 at 01:28 PM · Everest. October 7, 2017 at 03:12 PM · I used a sponge at the beginning, but then switched to clip-on rests to this day. October 7, 2017 at 03:49 PM · I have only ever heard of one other violinist who uses a Christino SR, and he's the one who introduced it to me. I like it because it clamps on well to the violin, and provides great stability when I'm playing. October 7, 2017 at 06:58 PM · For a long time I had a lot of trouble finding a shoulder rest that fitted me and didn't fall off all the time. I recently invested in a Libero de Luxe shoulder rest, which is significantly more expensive than most other options (about £300). However, I would recommend it to everyone! It has transformed my posture and comfort while playing. It gives support, a wide range of adjustment, and actually improves the sound by not gripping the sides of the instrument. It may seem a ridiculous price, but when you consider the amount of time you spend playing, I think that if you find something that can make such a difference it's definitely worth it. October 8, 2017 at 06:29 AM · I am glad you raised this topic. I am going quite crazy trying to find a shoulder rest that helps supporting my violin. My teacher suggested a Wolf secundo. I am concerned that I have had a lot of neck pain but this may be due to other issues (watching TV in a poor position). As an older person Iam conscious of the effects of poor posture - I don't remember having these problems when I learnt as a teenager. I am finding it is impacting on my attempts to master vibrato. Maybe it's just me falling apart. October 8, 2017 at 11:13 AM · The-Slipper™ has made a huge difference for me. October 8, 2017 at 06:55 PM · Beginner here. For 1 year I used a Kun because that is what my instructor gave me to use. I had constant shoulder neck pain and it led me to quit playing for 10 years. But I wanted to play. I started to experiment and found the most comfortable setting was No Rest. I had to work through a few chin rests to find the right one to use without the shoulder rest. I found two that work for me the Vermeer sold by Shar but it was only comfortable when my violin is way to the left, the way that Annie-Sophie Mutter plays (but than I can't reach the bow tip with my not so long arms). Then I tried the Flesch center mount with a hump after watching Rachel Barton Pine who has a very similar neck/face as I do (yes I know she uses a shoulder rest). I just started up lessons again and over the phone my new teacher was skeptical that I didn't need a shoulder rest. But on our first lesson she complemented me on my posture and nothing more was said about shoulder rests. Edited for clarity as follows. Oh I should mention that I never told my 1st teacher about the neck pain - I just thought that was how it was for me and after one year thought that I wasn't built for the violin. It was a combination of desire, professor v videos, and lurking here that led me to experiment and restart the violin with the correct setup for me. October 10, 2017 at 05:38 PM · I've always used a Kun on my violin. But when someone handed me a viola and told me to learn to play it, it came with a Wolf that was cranked up way too high for me. Even after fiddling with it a lot, I couldn't set it anywhere I liked, and it felt pretty wobbly at the best of times. Since the viola is thicker than my violin, I decided to take the advice of many people on this group and play restless. That didn't work too well; it was too unstable. The breaking point was my first concert, where the viola slipped all over the shoulder of my tuxedo jacket - which might have been entertaining for the audience, but wasn't much fun for me. So off I went to the local big music store, where I tried all sorts of shoulder rests: Bonmusica, Wolf, Everest, etc. I wound up settling on the good old Kun, just like on my violin. October 10, 2017 at 09:05 PM · Bon Musica is fantastic! It revolutionized my comfort and relaxation. A friend and I did a blind sound test between a clip-on rest, inflatable rest, and no rest. With the clip on the sound was much louder and more complex. It seems that if a pad or the shoulder sits against the body of the violin, it is not able to vibrate as much. Clip-on wins for sound!! October 11, 2017 at 11:58 AM · Across the pond in The Netherlands, a group of violinists are test-riding several interesting options: the Acoustagrip (www.acoustagrip.com) and the Gelrest (www.gelrest.com). So far, more than so good! These are wonderful products that enhance playing comfort. The Acoustagrip attaches magically (no glue, no clamps, no varnish damage) to the back of the instrument and to quote my colleagues "is more comfortable than a pillow and much more receptive to orchestral wear and tear than a clip-on shoulder rest. Also, our blindfold tests netted great results in terms of how the instruments sound! Add a gel rest to your chin rest and the comfort zone expands. Bravo to these great additions to our repertoire!